Santa Bill Wilson from Wisconsin has arranged for the MEDIC Regional Blood Center to have one of their "Blood Mobile Units" outside of the Gatlinburg Convention Center on Thursday, March 14th for the opening of the Santa Family Reunion Convention. The blood drive will begin at 8:00 am and finish by 12:00 pm. We are hopeful that not only our Santa Family Reunion attendees will step up to donate to this very important GIFT OF LIFE , but some of the thousands who are visiting the area on Spring Break will stop in to donate as well. 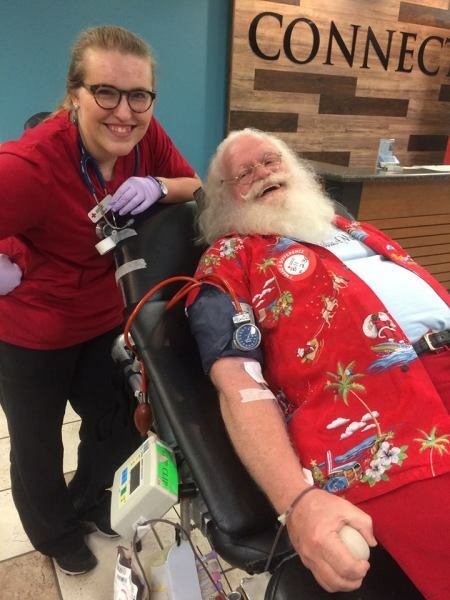 Santa Dan & Bonnie Felten of Wisconsin will be greeting and entertaining blood donners who visit the blood mobile. We are very grateful to all three of these delightful individuals who have stepped up to volunteer and make this event a part of the Santa Family Reunion Convention activities. as well as signing up when you get to Gatlinburg, TN. We would, however, greatly appreciate you at least sending Bill an e-mail showing your interest in donating blood for planning purposes. It only takes a moment to send Bill that very important note of interest in giving the GIFT OF LIFE! Support the MEDIC Regional Blood Drive . PLEASE join Santa Family Reunion in helping by making a GIFT OF LIFE blood donation while in Gatlinburg, TN.